The Crap Product Review: Things I Hated. | Becky Alyssa's Beauty Box. The Crap Product Review: Things I Hated. Welcome to my first ever Crap Product Review! I’ve amassed a large collection of products that just don’t work for me or that are plain horrible..so I saved them to tell you all about them! 1. Dove Deeply Nourishing Body Wash, £2.40 – This thing has been kicking around since I moved nearly a year ago! I bought it because my skin is sensitive to most shower gels and Dove is supposed to be so gentle and soothing and lovely according to their advertising. Unfortunately I really did not get on with this at all! It’s full of not-so-nice chemicals and is strongly over-perfumed, which irritated and dried out my skin rather than ‘nourishing’ it. I’ve been sticking to my natural shower gels and my skin has been so much happier for it. 2. L’Oreal EverSleek Absolute Smooth Intense Mask, £6.99 – I picked this up after reading a blogger recommendation: this product is designed for “frizzy, overworked hair”. Hey, I get frizz and split ends just like everyone else, so I’ll give it a try! It smells wonderful, but unfortunately did not work for me. After just one use my hair felt coated with build-up, lank and greasy despite rinsing it thoroughly. Maybe this would work better for thicker, coarser hair than mine. However I’ve been loving the EverRiche mask (which coincidentally smells like vanilla pudding) and I’d recommend that one over this any day. 3. Bumble and Bumble Thickening Hairspray, £7.50 – This is the first Bumble product I’ve ever tried and was sadly disappointed. I took it away on holiday with me because of its cute travel-friendly size, but I stopped using it after 2 uses. It did nothing to thicken or volumise my hair, only making it sticky and leaving it flat as ever. Sure, I understand it’s hard to keep hair volumised in humid climates, but it was just so much of a relief when I spotted my usual Tresemme Thermal Creations mousse in Ulta to give my hair some sorely needed volume so I didn’t have to keep using this. 4. Oribe Maximista Thickening Spray, £25 – What is it with all the crap, expensive hair products I seem to be amassing? I’d read some absolute rave blog reviews on this ‘cult product’ and how so many of them just can’t be without it. Although I’m quite liking their Dry Texturising Spray on clean hair (smells good, actually gives texture to soft hair and doesn’t leave annoying white marks), I believe Oribe products are tremendously overhyped and ridiculously overpriced. I used this once and it did nothing at all to thicken my hair, instead drying it out with alcohol and made it feel sticky. I might just stick with my HGs for now to avoid wasting any more money on useless hair products. 5. Maybelline Baby Lips in Hydrate, £2.99 – At least I didn’t pay quite so much for this! I received it in a swap before Baby Lips arrived in the UK a few months ago. It did seem to make my lips more hydrated at first, but dried them out horribly after using for a couple of weeks. This product should consider changing its name from ‘Baby Lips’ to ‘Crusty Lips’. I have far more success with my Nuxe Reve de Miel balm which is absolutely worth the money, and Vaseline on top for overnight healing magic. 6. E.L.F. Mineral Eye Liner in Black, £3.00 – I bought this during one of E.L.F’s frequent 50% off deals, since mineral makeup is supposed to be like pixie dust and give you flawless skin and feel weightless, or so the adverts say. Although this liner does apply soft, it comes out grey and smudges far too easily – unless panda eyes are the look you’re going for, avoid this one. At least I didn’t waste too much money on it. 7. Lush Vanishing Cream Moisturiser, £17.75 – I swear this used to be far less expensive? I’ve had it a while and paid around £15-16 for it. It does smell lovely and feels soothing on sensitive skin, but it was far too greasy and gave me horrible acne along my jawline. I’m saving it to use as body lotion and definitely wouldn’t pay such a steep price for it. Maybe someone with drier sensitive skin would appreciate it more. 8. Boots Botanics Colour Adjusting Foundation in Ivory, $12.49 – Quite bizarre how this is Boots brand and doesn’t seem to be sold in the UK! Seriously, I haven’t found it anywhere. I’d had this on my wishlist for ages and finally bought it from Super Target in the USA. Unfortunately I didn’t get round to trying it until I returned home and was pretty disappointed. The formula is far too sheer and watery to do anything about my redness and my skin was an oily mess after less than 2 hours, meaning I had to pile the powder on for any kind of coverage. I don’t understand how this is ‘colour adjusting’ when it doesn’t seem to do anything for me. 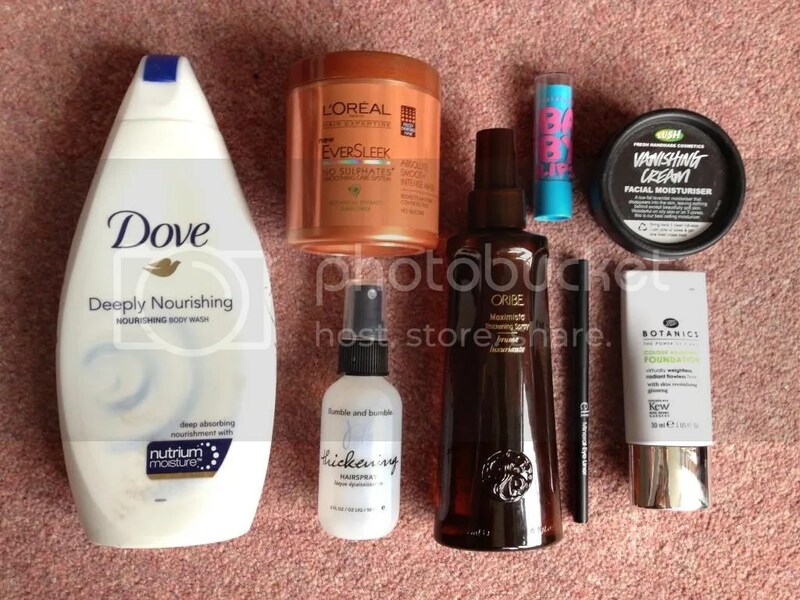 So there are my current ‘crap products’ I’ve tried lately! If it was possible to get refunds for disappointing beauty products in the UK my bank account would be far better off. I think everyone’s guilty of wasting money on rubbish products for one reason or another, so I’m not alone here! What are your least favourite products? Any really terrible experiences? My hair literally started smoking once thanks to a truly terrible ‘heat protectant’..but that’s a fun story for another day! This entry was posted in Uncategorized and tagged crap products. Bookmark the permalink.